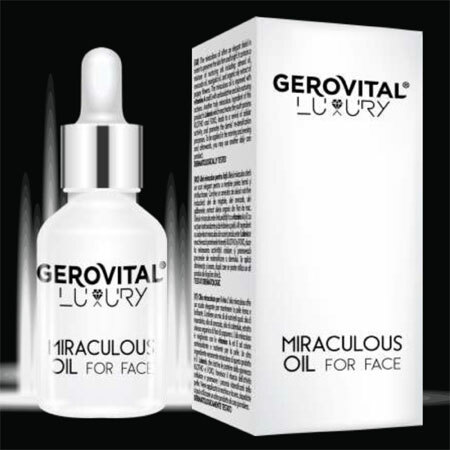 The Gerovital Luxury Miraculous Oil for Face has been designed as an equally efficient shield and pampering product aimed to protect and preserve the skin’s firmness, healthy glow. With a formula that gets absorbed easily, it is light enough for daytime use. Balanced with a mixture of nurturing oils including: almond oil, avocado oil, marigold oil, and organic oily extract of poppy flowers, it offers relief to dry or dehydrated complexions, improves the signs of premature aging, fights dullness. Vitamins A and E, with anti-oxidative and skin nurturing benefits, protects against free radicals damage, condition the skin, help reduce wrinkles, fade brown spots, and smooth complexion. Lakesis, with a direct action on the youth proteins FOXO and Klotho, revives the cellular activity and speeds up the dermal re-densification processes. Usage: Massage a few drops onto cleansed face and neck and décolletage, both morning and evening. Insist around the eyes, mouth, forehead and neck, areas which are prone to fine lines and dryness. Allow to absorb for one to three minutes. Layer underneath or on top of moisturizer. Use twice daily, in the morning and evening. Apply on cleansed skin all over the face, neck and décolletage. Insist around the eyes, mouth, forehead and neck which are prone to fine lines and dryness. Layer underneath moisturizer or on top of moisturizer, to seal in hydration. INGREDIENTS: ISOPROPYL ISOSTEARATE, UNDECANE, TRIDECANE, SQUALANE, PRUNUS AMYGDALUS DULCIS OIL, CAPRYLIC / CAPRIC TRIGLYCERIDES, ARGANIA SPINOSA KERNEL OIL, HELIANTHUS ANNUUS (SUNFLOWER) SEED OIL, PLUKENETIA VOLUBILIS SEED OIL, CYCLOPENTASILOXANE, CYCLOHEXASILOXANE, TOCOPHERYL ACETATE, RETINYL PALMITATE, TOCOPHEROL, PAPAVER RHOEAS PETAL EXTRACT, CALENDULA OFFICINALIS FLOWER EXTRACT, PISTACIA LENTISCUS GUM, BHT, PARFUM, BENZYL SALICYLATE, LIMONENE, LINALOOL, CITRONELLOL. GERANIOL, AMYL CYNNAMAL, HYDROGENATED PALM GLYCERIDES CITRATE, GLYCINE SOJA OIL.